Who will find the golden EDC Easter Bunny? The golden EDC Easter Bunny will hide in one of the EDC Wholesale orders. Whoever finds the easter bunny wins. 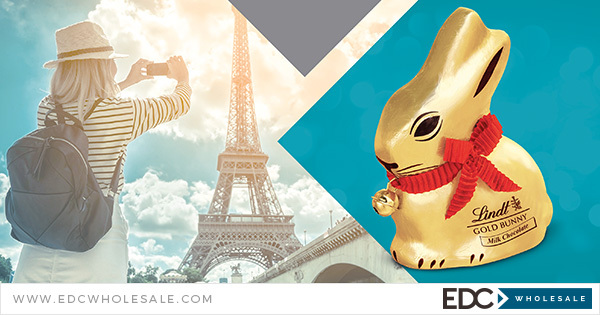 To celebrate Easter, every customer that places an order at EDC Wholesale between 27 March and 16 April has a chance in finding a golden Easter Bunny. The person who receives the Easter Bunny and proofs it by sending a picture of the bunny to EDC, wins a fully catered city trip to an European city, including pocket money. EDC Wholesale ships 30.000 packages world wide on a monthly base. One of these orders will contain a special delivery, randomly picked by the EDC Easter Bunny himself. During March Madness customers can still benefit from 10% extra discount on all EasyToys Collections and throughout April from 10% extra discount on Sway Vibes.